Our next Bar Exam Cram Session for the February 2019 bar exam is Sunday, January 20, 2019. To learn more or to register: click here. Below is a sample video of short excerpts of one of our past Bar Exam Cram Sessions. My hope is that this will give you a sense of what the course is like and how it is received by our students. We cover a lot of ground and our students leave with a new confidence. A Little More About the Bar Exam Cram Session – What is it? It more than just a condensed review of the bar exam tested topics. When we go through each topic, I include a focus on areas that have not been tested in a long time and explain how these areas could come up and what issue combinations are most common. I also explain that when these issues are tested, what it is usually tested in conjunction with and how to write the most commonly tested topics. But, wait, there is more (and this is one of the reasons why examinees fail the California bar exam) did you know that on virtually every Defamation essay the bar examiners expect you to also bring up (even if you can not prove all of the elements) the tort of intentional infliction of emotional distress? Well, they do. Did you know that on virtually every Defamation essay the California bar examiners will test either the privacy torts or the economic torts? This is possibly what I love the most about teaching these sessions – being able to pass on information that is critical to passing but, that simply doesn’t seem to be available anywhere else. I am really proud and grateful to be able to provide this kind of review. Commercial outlines contain this information, somewhere, but the problem is that commercial outlines can not direct your emphasis or provide a focus for you. I believe that one of the best ways to prepare for the bar exam is to have both a real command of the substantive law (that is a given) but what is equally, if not more important is to have the correct context. How will issues combine, what is perhaps overly due because it has not been tested in several years, how do you write the essay, what are the examiners expecting in terms of coverage of particular issues? These are just a few of the areas that we address. 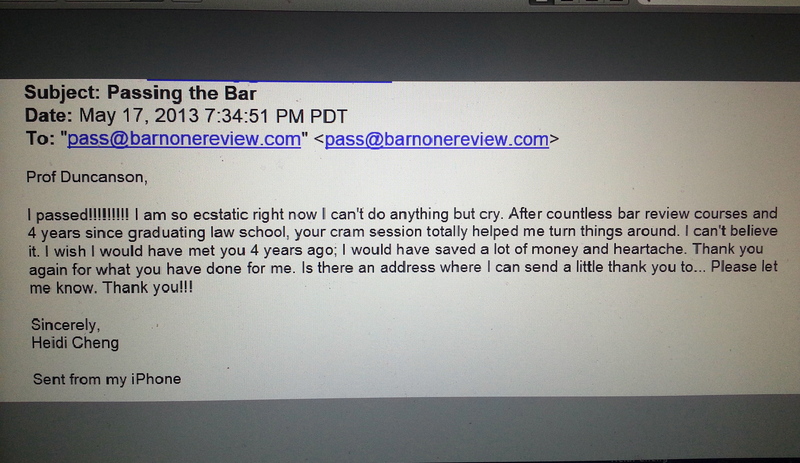 For more information, visit: www.barnonereview.com Click here for testimonials. We tell you what you need to know, you receive a complete set of The Bar Exam Cram Sheets, a study plan for the final ten days leading up to the bar exam and all of the Bar Exam Guru’s predictions and email updates up through the bar exam. Why should you choose The Bar Exam Cram Session? 1) It builds confidence. Confidence is a huge part of success on the bar exam. But, it rarely comes from sitting through countless hours of mind-numbing-videotaped bar review lectures. Bar Exam Cram Session attendees learn how to make sense of it all, how to approach each essay with confidence and ease. Our subject drills develop confidence and provide our students with an “at their finger tips” kind of approach to the exam. 2) Live Instruction in real time makes a difference. Our students come to us because they are tired of trying to “make sense” of it all . . . all on their own. When was the last time your videotaped bar review session was engaging or . . . more importantly . . . when was the last time you had someone provide you with a bar exam topic drill? Our Bar Exam Cram Sessions present the tested material in a memorable and clear fashion. Students leave feeling inspired and motivated and encouraged. 4) There is no reason to re-invent the wheel. The bar examiners want it the way they want it. They do not suddenly change what is required for a passing or better than passing essay on easements, for example, or for a products liability essay. The bar examiners truly are testing the same thing over and over and over again. There is no reason for you to have to guess, predict or wonder what will be on the test or how it should be presented. Passing the bar relies on the same information and skill set every bar round. We know what that skill set is and we pass it on to you. The substantive material rarely changes (and when it does, we are on it – for example – all of our California Bar Exam Cram Sheets include the California distinctions added to the California Bar Exam). Course Fees: $995.00 – Includes full set of The Bar Exam Cram Sheets, instruction covering both substantive material as well as essay approaches, extra emphasis on predicted areas, a motivating and encouraging environment that continues beyond the class as students continue to receive email support up through the bar exam, our Ten Day Study Plan telling you what to study and how to study for the last ten days leading up to the bar exam, sample essays for likely essay topics (based upon the predictions) are sent via email in the weeks leading up to the exam with instructions on how to review these essays. The program is truly unique, builds confidence and provides true insights into the technique and what is really required to pass the California Bar Exam. No question, the best choice I made in the past year was to sign up for your full program, the Score Maximizer Program. You gave me a fresh approach for all parts of the exam, including the Performance Tests, and it was as though the proverbial lightbulb went off. I would not hesitate to recommend you to anyone needing to retake the bar, or to attorney takers. You were the perfect teacher for me, and that’s no small thing. I wanted to drop you a quick note to express my heartfelt thanks for the great assistance you gave in your two-day California Bar Exam Cram Session for February 2013. Having not taken a bar exam for two decades plus, and never studied for the California bar, I believe that your session and, in particular, the crucial guidance you gave for the last two weeks of study, made the difference and enabled me to pass on my first try. I have recommended your course to a number of friends and colleagues and urge you to post this to your website if you wish. That you could teach this old(er) dog enough “tricks” to get through is a real testament to your methods. I want to extend my thanks to Professor Duncanson for her help in preparing me for the exam. Her insights and predictions were incredibly helpful and I wanted to express my gratitude to everyone at Bar None for your help throughout this process. Thank you! This was my fifth time to take the California bar exam and I finally passed it! The Cram Session is so amazing, Lisa puts all the topics, approaches and predictions together. It is very informative. I strongly recommend Bar None Review to anyone who wants to pass the examination. I am a foreigner who was born and raised in Shanghai, China. I did not go to the United States until I graduated from college in Shanghai. I got an LLM degree at USC. But, I never took any first year class. And I passed the California Bar Examination with Lisa’s help. If I can do it, everyone could do it. All you need to do is attend Bar None Review class and be a good student, pay attention and do what she says. Lisa will help you to achieve your dream.